One of the most important services in any health care organization is that of the pharmacy. 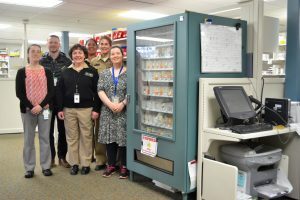 In rural Alaska communities, pharmacy services are especially important as approximately 10,000 customer-owners reside in the Rural Anchorage Service Unit. At SCF, the Rural Anchorage Service Pharmacy Team received national recognition for its work fostering relationships and providing the highest standard of safe, effective, evidenced-based pharmaceutical care. The RASU pharmacy team is the recipient of the 2018 Indian Health Service Director’s Award for Fostering Relationships. The SCF RASU Pharmacy consists of three dedicated clinical pharmacists and three certified pharmacy technicians. This small team has 60 years of experience providing pharmaceutical care for 55 rural communities whose health care is administered by 17 different Tribal Health Organizations. The magnitude of services and the breadth of relationships this team has developed is evident by the numbers. Last year, the team mailed 55,437 prescriptions to rural customer-owners, dispensed 17,142 orders through telepharmacy, sent 512 clinic stock orders, filled 4,000 telepharmacy replenishment orders, prepared 28 dental boxes for traveling dentists and provides formal orientation to 15 traveling rural providers. The RASU Pharmacy sends all medication supplies to rural customer- owners through the U.S. Postal Service. The team addressed significant challenges to mail delivery in 2017 by collaborating with village clinics employees, tribal health organization health administrations, and the U.S. Postal Service administration to develop village-specific solutions to address the challenge. The provision of pharmaceutical care in rural Alaska is complex. By working in collaboration with the Alaska Community Health Aide Program, tribal health directors, and individual providers, SCF RASU has a crucial role ensuring customer-owners living in remote locations have access to available, effective and appropriate pharmacotherapy.